Message transcribed by Goldenlight, www.thegoldenlightchannel.com. © The Golden Light Channel. Please include this copyright and credit, and a link to the source message when re-posting this message. Permission not granted to use on YouTube. Good afternoon we are The Council of Angels, including Archangel Zadkiel, Michael, Chamuel, and Raphael. Dearest Michael of the Blue Ray, as you know is the beloved protector angel, wielding his shield of truth, protection and love to assist all humans in need. Our dearest Beautiful Chamuel of the Soft Pink light sends you her unconditional and unwavering love and wraps you in this blanket of unconditional love for now and all time. Dearest Raphael our healing angel of the Green Ray is with us as well, as is Archangel Zadkiel, our beloved transformation and alchemy angel also tied to the Violet Flame and the Violet Ray. We are some of the angels that comprise Goldenlight’s Council of Angels. She first became aware of us in 1993 in a meditation, and then became aware again of her ties to us when she had her Reconnection done 2 years ago in the summer of 2012. (1) During this beautiful session which reconnects you with the knowledge of your soul origins and blueprint, galactic origins and blueprint, and divine blueprint, as well as memories of your soul contracts, pre-birth contracts, life’s mission on earth, and so much more, during this session that Goldenlight had done, she “reconnected” with us in a very permanent way so that she has access to us at any time simply by first tuning into her higher self and then to all of Us. You too can restore your connections by having this Reconnection session done as it can assist you in connecting with all of this knowledge that your higher self and soul has but that is often difficult to access until you have had this process done. We are not endorsing this process, simply allowing it as a suggestion that it may assist you in accelerating your spiritual process which is something that has been occurring for many humans on earth at this time. For those of you who chose rapid spiritual growth on earth and also who are starseeds wanting to assist with ascension, many of you are now “waking up” rapidly and realizing that you have a desire to get on track with your spiritual progress… for remember you are all spiritual beings having a human experience and your being is a large beautiful celestial energetic force, so much larger and grander than you are even capable of imagining. So all the starseeds and those who came here to help with ascension are now remembering this about themselves and wanting to explore it further and this then will propel all starseeds rapidly onto your desired course for spiritual acceleration and towards ascension. 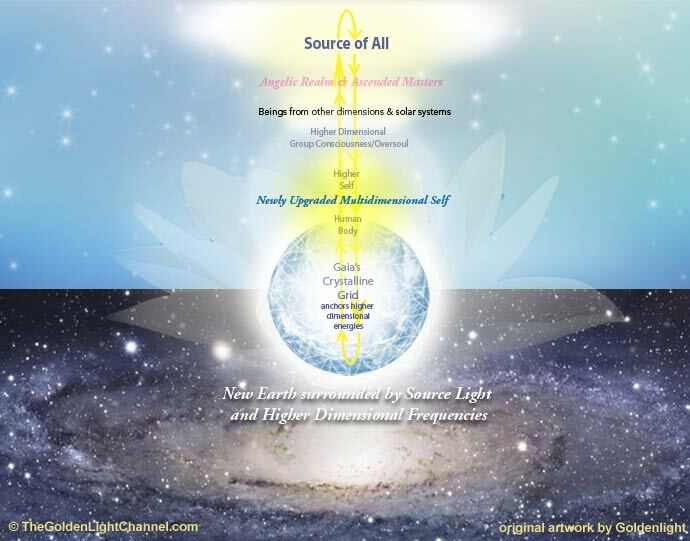 Now ascension as we have said many times in our previous messages (refer to ebooks (2), note from Goldenlight), ascension is simply a harmonizing with the higher dimensional frequencies which have rapidly accelerated around your earth. These higher dimensional frequencies are causing upgrades in everything now, from your human bodies and brains, to your etheric and higher dimensional minds, to all of the “material” objects around you. You may have noticed in the most recent period of time in your “now” that everything around you or in your home or place of work seems to be needing to be upgraded. The channel Goldenlight experienced this recently wherein she had 4 major appliances including her vehicle all break down, or needing repair, or replacement to newer, more upgraded models or parts, all within two weeks time! This was symbolic of what is now occurring on your planet, within your lives, and within your bodies. As you may know, your chakra system is being upgraded from 7 to 12 chakras, the range of colors that are visible to the human eye have increased and expanded, allowing for “new” colors to be visible to you, and your bodies and brains are going through a “re-wiring” and “upgrade” process wherein your newly “converted” structures are being attuned to being able to rapidly accept greater and greater levels of light and frequency. For as the frequency around your earth and of the earth itself is rapidly raising, so too must your bodies follow with this upgrade in order to survive in this new environment. But not to worry, there is nothing that you have to “turn on” or “do” to make this happen other than doing your best to stay in a high vibration at all times, as this upgrading process has already been written into your DNA as a human so that this would be activated at the correct moment, which is now happening in your NOW time. So this is a little background on why this reconnection process is so important as it will accelerate your spiritual growth, ascension process, and awareness of your soul contracts as well as your connection to your Higher Self. When the channel had her reconnection session done, she became “hard-wired” to her higher self from an awareness and communication standpoint. Indeed it is your awareness of this connection that can shift so that you become aware that there is an extension of your being already living in the higher dimensions and so when you connect to this higher self regularly with awareness, you then begin to merge with your higher self which is another aspect of the ascension process, and which connects you in with your multidimensional self. Another part of the ascension process (for it is a process, not a one-time event), is the remembering and reconnecting with your star family origins. The very first step in beginning to connect in with your star family origins is through an awareness in meditation after connecting in with your higher self. Now we have given a technique to the channel Goldenlight that we would share with you of connecting with your higher self. This technique is to simply sit or lay comfortable, breathe deeply, and begin to shift your awareness towards your higher self, which is that part of you already existing in the higher dimensions. Then simply state in your mind, “I connect with my higher self, please connect with me.” Now after you have practiced this a few times, you will be able to actually “feel” the connection in your body wherein a large “swoosh” of energy comes into your body and energizes and enlightens you. This is practiced by the channel Goldenlight and when she feels this “swoosh” then she knows she is connected in. You may not feel this at first, in fact it may take some time to establish this strong connection, but it is important to keep practicing connecting in with your higher self on a daily basis, and to know that it is simply by intention that you will be connected in. In reconnecting with your “galactic” or star family origins, we would also suggest that in this daily connecting session with your higher self (which you may wish to do each evening before retiring), if you wish to have a conversation with your higher self and/or your star family, you have the ability to do so in written form at any time. You can connect in with your star family (i.e., your Pleiadian, Sirian, Andromedan, Arcturian, or other star family) at any time after your initial contact with them. Now this is as simple as it is in connecting with your higher self. We of the higher dimensional star systems communicate solely via telepathy; the spoken verbal form of communication practiced on earth is somewhat “archaic” or “elementary” to us, and we know that in time with practice you will awaken deeply this technique within yourself as well. If you wish to ever “reconnect” with us, you may do so by first connecting in with your higher self and then ask to connect in with your star family. We may then begin to have a dialogue, you see, which will be coordinated by your higher self, in which we can reconnect with you and re-establish this wonderful connection which is really part of your own personal galactic history as a being. We would like to suggest that this may assist you in connecting in with your life’s purpose once you make this daily connecting in with the higher dimensions a regular practice. So you see by reconnecting in with your higher self (which remember is the larger part of “you” existing in the higher dimensions), on a conversational basis as well as with your galactic family on a telepathic basis, you will then begin to receive information which directly connects you into the knowledge of all of your pre-birth contracts, life’s mission, etc., which is really the whole purpose for coming here to earth in the first place, although many have forgotten. So this is the way to remember and we also suggest as previously that combining this with having this “reconnection” process done by a certified practitioner, this will propel you rapidly onto this path of first remembering and then fulfilling your life’s purpose here at this time. Many starseeds have forgotten their origins because of course they agreed to the veil of forgetfulness as part of the earth contract, but also in knowing that a time would come wherein you could intentionally remember this information so that you could be enriched and fulfilled in fulfilling your soul contract there on the earth planet at this time. And now a final word from the Council of Angels. We want you to know that though the path on earth is oftentimes fraught with many twists and turns, and though the road ahead may oftentimes seem unclear, that we as the heavenly hosts of the Prime Source Creator are in existence to help fulfill the Creator’s love for all beings and that we are ever near to assist you in all areas of your life, to light your path and lead you to joy, fulfillment, nurturance, and love from within. For all beings are an extension of Source Creator; you are an emanation of Source Creator, which means that you are Source knowing Source. For in the beginning there was only Source and so to know itself, Source multiplied so that it could know itself other than knowing the nothingness. And so you are all an extension of the original Prime Creator. Each individual soul is a beautiful spark of the most brilliant love and light that you could ever imagine. You have a mission to fulfill here, you have a very important purpose and your light signature is unique in the universe. There is no other like you. This is the beauty of your soul. Know how precious and loved you are. Know that nothing can stop your spiritual growth and ascension process. Encourage yourself in knowing that as you continue to attune yourself to the higher dimensions, your ascension process is accelerating. Know that we of the Angelic realm love you indiscriminately, unconditionally, and Always and in All Ways. We thank you for allowing us to be of service to you this evening. May your light always shine forth into the world and also within your being, knowing that you are always loved, safe, and that you are right where you need to be on your journey. The Council of Angels including Archangel Michael, Archangel Zadkiel, Archangel Chamuel, Archangel Raphael. If you enjoyed this message, please consider a donation today. See donation button on the sidebar. Message transcribed by Goldenlight, www.thegoldenlightchannel.com. © The Golden Light Channel. Please include this copyright and credit, and a link to the source message when re-posting this message. Permission not granted to use this message on YouTube. It was after I had the Reconnection done that I started channeling my Council of Angels, became more connected with my Higher Self, discovered my life’s purpose (we each have more than one), and my pre-birth contracts (which are tied into our life’s purpose.) The Reconnection is a once-in-a-lifetime process that is done by a spiritual practitioner who is trained by Dr. Eric Pearl who discovered Reconnective Healing (a healing modality which is related to the Reconnection. But “The Reconnection” itself is a specific 2-day session, about an hour or so each session), in which the practitioner “re-connects” you with many things such as your soul’s blueprint, your galactic blueprint, and, I believe connects you in more with your higher self, guides, angels, etc. It is a different experience for every person that has it done, so yours will be different than mine, but for me it also “re-connected” me with the awareness of what I call my Pleiadian Family, where I lived many lifetimes, after the birth of my soul in the angelic realm. And yes, I was actually able to go back that far in time to the creation of my soul! Everything that has been unfolding for me since I had the Reconnection done in August of 2012 has been a slow, gentle, unfolding process of discovery for me. I highly recommend having it done! There are practitioners all over the world . Dr. Eric Pearl has been traveling all over the world to teach The Reconnection process and Reconnective Healing to as many people as possible. I also believe it brings in the higher dimensional energy that is a part of our ascension. It is a very easy process, it is like getting an etheric or spiritual healing…you simply lie on a massage table while the practitioner does things around your body to “re-connect” you…I’m not sure exactly what they do, but it is quite pleasant and only lasts 45 minutes to an hour or so, for two days in a row. If you would like to read these ebooks but cannot afford to buy them, please make a donation in any amount and you will receive a link to download them.